If you have oily hair, do you really need to use a shampoo? Yes. The problem with oily hair is that too much oil can lead to your hair becoming greasy. Choosing the best shampoo for oily hair problem is a tedious thing unless you know the reason behind the oily hair problem and what it takes to get rid of oily hair and scalp. The root cause of greasy hair is because of an over-production of sebum. Wondering what sebum is? Sebum is a wax-like substance that occurs naturally in the human body. The primary role of sebum is to keep your hair soft, supple, and waterproof. It is produced by the sebaceous glands and the higher number of these glands can lead to oily or greasy hair. Normally, people with a higher volume of hair tend to have the higher number of sebaceous glands, which is directly responsible for the higher production of oil. Oily hair or scalp is a condition that can be also brought about by a series of hormonal changes especially those occurring during puberty. Last but not the least; oily hair attracts dirt and more oil. Hence, if you are not consistent with hair cleansing and maintenance then this can lead to building up of more dirt and toxins leading to extremely greasy strands of hair and severe hair damage. Oily hair means oily scalp and hence choosing the right shampoo for taking out the excess oil without drying your hair or damaging it, may look like a tough job. In a nutshell, the product you require should be the best shampoo for oily hair. The shampoo should be able to act as an oil-control special ﻿hair care product. This type of shampoo should not end up over-stimulating the sebaceous gland, which can result in releasing more oil and thus making your hair extremely greasy. 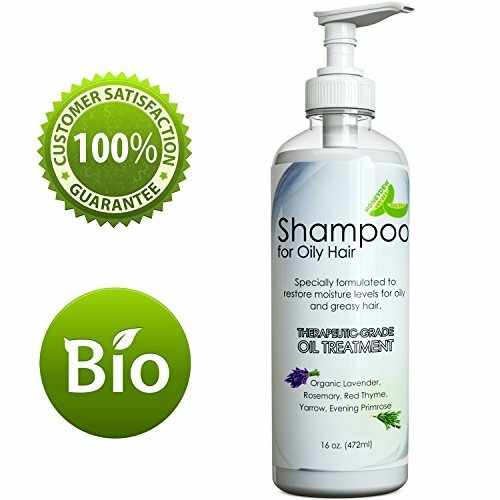 So, what is the best approach towards finding the best shampoo for oily hair? We have made your work a little easier by researching and documenting the 10 Best Oil Controlling Shampoos for oily hair that are definitely going to help you fight the problems of greasy hair. The first oil control shampoo in our list is degrease shampoo from maple holistic. The Maple Holistics degrease natural shampoo is the perfect therapeutic solution for your oily hair and scalp. It has been created solely for providing relief from itchy scalp and greasy hair. It is an 100% Natural Treatment for both men and women as well as the teens. This maple organic shampoo Stimulates Cell Renewal and also Increases the Scalp and hair Circulation. It is a gentle shampoo and Safe for Color Treated Hair​. The primary ingredient of this natural shampoo is Rosemary, which is used most often in the form of an essential oil across the world. It is considered to be extremely effective for treatment of Alopecia or hair loss in both men and women. Rosemary is a perennial woody herb known as Rosmarinus officinalis and is considered to be a native to the Mediterranean region. People who are suffering from both dandruff and oily hair problem, Maple shampoo is a best anti dandruff shampoo for oily scalp. Shampooing hair with degrease shampoo will help you to get rid of greasy hair quickly. This shampoo gives a solution to the oily hair problem rather than covering the problem. ​Sulfate free! 100% Botanical - Ingredients certified by QAI & the United States Department of Agriculture for Organics Processing. Here's something new and different that definitely deserves a try because it had to be on the list of best shampoo for oily hair. Wondering why it is on shampoos for greasy hair list? This shampoo for greasy scalp is actually a translucent dry shampoo spray that does its job quite well, which is removing excess oil! The Alterna bamboo style cleanse extend translucent dry shampoo has two primary ingredients and they are mango and coconut. It may sound quite weird but the fact is that Mango is great for your hair! Yes, it is the same succulent and delicious mango that you would love to have for breakfast. It is rich in vitamins A, B1, B2, B3, B6, and C and aids in healthy hair growth. It is a great moisturizer and helps in improving the elasticity of hair strands. Coconut is normally used in the oil form for hair and can be used almost on any type of hair. It comes with a wide variety of benefits that includes the strengthening of hair follicles, treatment of hair loss, cooling of the scalp, and fighting dandruff. How this Shampoo is good for the oily hair problem ? It does not contain radicals that are harmful to hair or scalp including paraben, sulfates, synthetic dyes, phthalates, GMOs, and triclosan. It has a subtle but refreshing aroma of mango and coconut. If you have been looking for the best shampoo products for oily hair that is refreshingly fresh and made up of natural or herbal ingredients then Klorane gentle dry shampoo with Oat milk is what should interest you. The primary ingredient in the Klorane gentle dry shampoo is Oat milk. What is oat milk? It is derived by soaking whole groats or oats (Avena sativa) in water. Oats grow mostly in the temperate regions and are considered to be an excellent source of various essential nutrients including manganese, beta-glucans, dietary fiber, B-vitamins and much more. The good news is that Oat milk offers plenty of benefits for your hair. It acts as a humectant, which means; it is able to draw water from the atmosphere and makes your hair and scalp well moisturized. Since it contains plenty of vitamin B, it plays a vital role in fixing damaged hair and making hair strong and elastic. klorane dry shampoo is one of the best hair products for oily hair as it also brings a lot of shine and softness to your hair! Klorane gentle dry shampoo with Oat milk contains a blend of rice and corn starches, which promote absorption of excess oils or sebum. There are many people who prefer using a dry shampoo over the conventional liquid shampoo.This is mostly so as it minimizes the need for a bath every time you want to use the shampoo. The Batiste dry shampoo is one such oil reducing shampoo that will strengthen your hair even without wetting your hair! The primary ingredient of the Batiste light and batiste dry shampoo is Oryza Sativa (rice) starch. This is commonly known as the Asian rice and is a type of grass that grows primarily in the temperate regions of East Asia and upland regions of Southeast Asia. Another type of the same rice is also grown submerged and is found across tropical Asia. The reason why Oryza Sativa (rice) starch is used in shampoos is because of its many beneficial properties like it is a great absorbent and can absorb extra oil from your hair and scalp. It also acts a good emollient meaning; it moisturizes your scalp and softens your hair. Rice starch blended in the no-shower or waterless dry shampoo protects your hair roots and follicles from damage and prevents broken strands of hair. The dry shampoo contains oryza sativa (rice) starch, which removes excess oil, moisturizes naturally, and adds strength and shine to your hair. 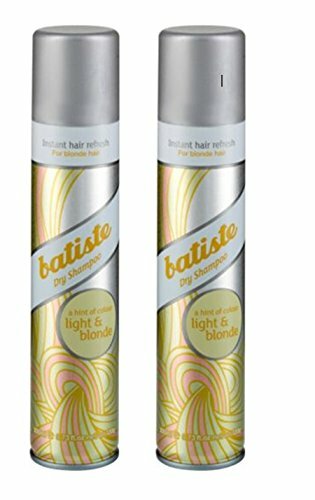 Batiste light and blonde dry shampoo is considered beneficial for light and blonde hair types and is responsible for adding volume to your hair. The dry shampoo has a hint of gold and this helps in disguising any whites or grays in your hair. Nothing comes closer to being a complete hair care product than the Tru Moroccan clarifying shampoo. It is a good shampoo for oily hair that has been specially created using all natural oils and herbs so that you can deal with oily and greasy hair. Tru Moroccan is a Gentle and natural Clarifying Shampoo ideal to combat oily, greasy hair, itchy scalp, and dandruff. It is also safe shampoo for color treated hair and hair that has been weakened, damaged by color, chemical processing or heat styling. The primary ingredient in the Tru Moroccan clarifying shampoo is Argan oil. This is a type of plant oil that is extracted from the kernels of the argan tree (Argania Spinosa L.). This helps in fighting off problems associated with oily or greasy hair. Why it is the best Shampoo for oily hair? The clarifying shampoo with argan oil helps in combating greasy and oily hair and provides relief from dandruff and itchy scalp. 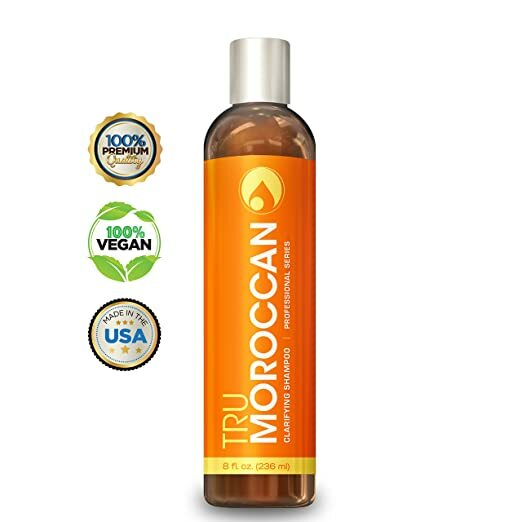 The Tru Moroccan clarifying shampoo is considered the best shampoo for thick oily hair as it is able to remove excessive build-up of sebum and thus prevents oily and flaky scalp. The shampoo helps in deep cleansing. It can reach deeper into the scalp and strengthen hair roots, cuticles, and shaft. Natural Ingredients, Contains No Parabens, Pabas Or harmful chemicals. No ingredients derived from animals. Made In The USA In Our Advanced FDA Certified Facility. Fresh Citrus fragrance, no artificial color, no artificial additives, or impurities. Not tested on animals (Cruelty Free). Apivita is one of the best natural balancing shampoo for greasy hair that you can find in the market. It assists in deep cleansing of the hair without any form of skin irritation. This product is also very effective when it comes to preserving the health of the scalp. It contains thyme, propolis natural lipoaminoacid and nettle for reducing sebum secretion. Apivita Propoline is also the best shampoo for fine oily hair and has a blend of peppermint which provides a hint of freshness. The development of this shampoo is done with a system of Bio Cotton Protection for strengthening the texture. It develops a defensive shield against environmental damage and leaves the hair lustrous and bouncy without overloading it. One advantage of this formulation is that even people with coloured or dyed hair can apply. However, it is slightly more expensive that other shampoos. What Apivita Propoline Balancing Shampoo does for Very Oily Hair? Some of the active ingredients in this product include polycyclic musks, propylene glycol, mineral oils, silicones and parabens. All these natural ingredients assist in eliminating excessive sebum and oil that accumulates in the hair. You will no longer have greasy hair once you start applying this product. Degrease is one among the best shampoo for oily hair and is made with lemon, cypress and basil. It strips unnecessary oils off your hair leaving it smooth and glossy. It enhances the health of your scalp by balancing and circulation of sebum and PH levels of the skin. This formula promotes skin relief, kills germs and leaves you feeling soothed and clean without flakes of the scalp and hair loss. It also cleans hair follicles and pores thus strengthening and promoting hair growth. The natural treatment found in this shampoo has several many health benefits to the hair and scalp. It is also considered as the best drugstore shampoo for oily hair. This multipurpose tool eradicates irritation on the skin and provides protection against pollutants from the environment and the sun. The design of the recipe used in producing this shampoo eradicates head pains, moisturises and hydrates the scalp. Thick hair will grow from a healthy scalp. The enhanced formula of Botanical Keratin in the shampoo helps in eliminating weightless, long and luxurious locks. 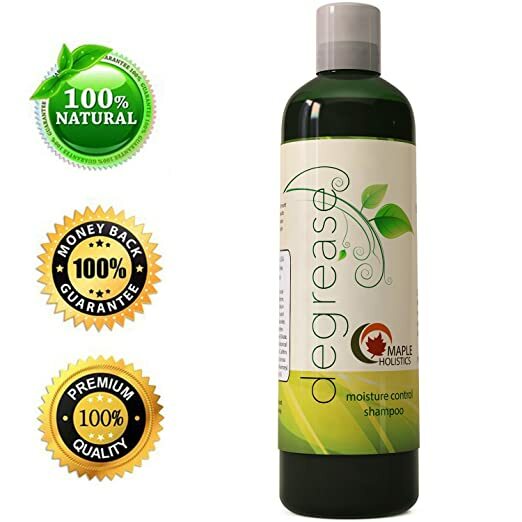 Why Degrease Shampoo for Oily Hair? The herbal ingredients like peach kernel are rich in vitamin and antioxidants. The degrease shampoo is sulfate free and has no artificial fragrances. This mixture is treatment for all textures of hair be it coloured, dyed, processed or natural. It removes the grease in the hair leaving it silky, glossy and lustrous. The calming remedy calms scalp discomfort and beautifies your hair. This product presents an environmentally friendly shampoo that thoroughly and gently nourishes and washes without drying out or stripping your hair. Christina moss naturals organic shampoo will greatly improve the condition of your hair and scalp. You can also apply it for colour treated hair and it generates a very full lather. It is an organic product that contains 100 percent natural ingredients. The product remains fresh and safe even six months after you make the purchase. You could also return it to the manufacturer for a full refund or replacement if it does not meet your expectations. The shampoo will assist you to maintain the vibrancy and freshness of your hair. The product has no harmful and toxic chemicals like sulfate. It repairs any damage to your hair and skin in a natural manner. The product comes from Christina Moss naturals and can be used by both genders. Why Christina moss Shampoo for your Oily Hair? The natural ingredients in this shampoo will leave your hair beautiful and healthy over a long period. It is the best option for individuals with a sensitive scalp or skin. The product does not contain any petrochemicals, synthetic fragrance, dyes, sulfates, paraben, and SLES, SLS, PG and PG derivatives. Honeydew is natural hair shampoo for oily hair that is suitable for both men and women and contains exceptional therapeutic grade oil formulation that cures the primary causes of greasy hair. Therefore, it presents one of the best oily hair shampoos that you can find in the market. The formula nourishes dry and damaged hair while providing a relief for oily scalp. The organic lavender ingredient has aromatic and nourishing properties that are soothing and reduce blemishes on your scalp. Rosemary is very good when it comes to the renewal of cells and thinning your hair. The evening primrose organic compound has a high content of Gamma Linoleic acid that prevents the loss of hair and promotes its health and growth. Yarrow reduces on oiliness by regulating glands that are in the scalp. The formulae are infused into a moisturizing shampoo base that is free from harsh chemicals and parabens. What are the advantages of using this oily hair shampoo? It is natural and pure and has no colours or fragrances. You can apply it on all types of hairs including frizzy and curly hair. The shampoo preserves the pigmentation of all types of hair colour sheds ranging from grey to while to dark black hair. The product will exceed your expectations in effectiveness and quality. It is formulated with Botanical Keratin, B5+ Jojoba oil and pro vitamin to maximize therapeutic efficacy and increase permeability. It is safe for colour treated hair and is sulfate free. The product is not tested on animals to support cruelty free advocacy. The main ingredients of this oscar blandi dry shampoo powder include wheat proteins for strengthening, vitamin E and Starches for absorbing oil. This oily shampoo presents a light-weight mist that has a hint of sweet floral scent combined with a lemon verbena smell. Some dry shampoos leave behind white powders that are easily noticeable, some of them may make your hair matte while other products gunk up your root. oscar blandi shampoo dry cleans subtly and leaves absolutely no residue. This explains why most people consider this product to be a beauty editor obsession. All you need to do is to mist a cloud of the product on your head, tousle the roots using your fingers to distribute, and then brush it through. The effects of each application depends on the effect of your hair. Why oscar blandi is the best dry Shampoo for Oily Hair? This shampoo gives thick hair a longer life. It is voted as best shampoo for oily hair and also, the Oscar award winner shampoo. It is extremely tough to decide which shampoo is best for oily hair. 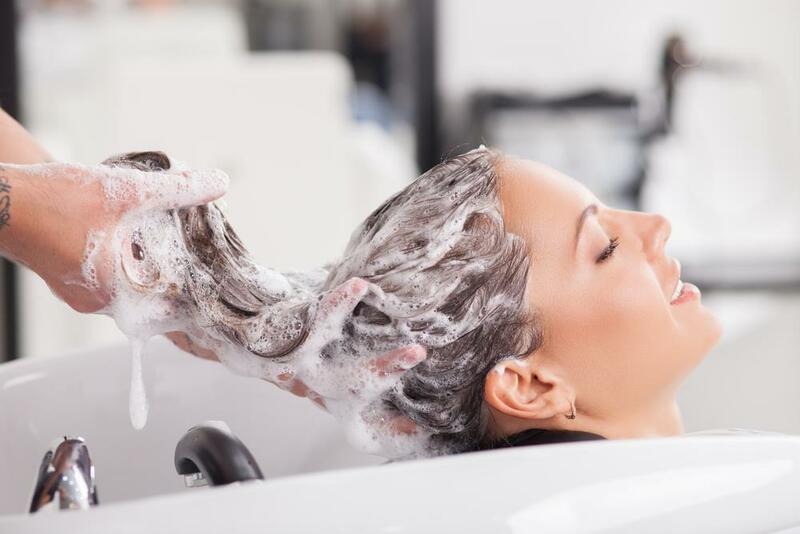 While searching for the right shampoo, you must look into certain things to get the best results after using the product. First and foremost you will have to look, is this shampoo specially formulated for oily hair? How to spot a shampoo specially made for oily hair? Easy, it will be written on the label of the shampoo bottle. Secondly, you will have ensure there are no added oils or silicone contents in the shampoo, you can get this information from the details printed on the back of the bottle. If you find any such information then you should avoid using those shampoos because any added oils or silicone will tend to induce more oil secretion which will lead to excess build up. Third, you will have to look for clear shampoos when dealing with oily hair and scalp. Clear shampoos are generally free from any additional conditioners as they contribute to the buildup of excess oils. Finally, you will have to look for the Ingredients of a shampoo when you're treating greasy hair. Citrus extracts and astringent herbs are the two most effective ingredients for treating oily hair. They both will help stop the secretion of excess oils. Rather than buying any shampoo for greasy hair, spending your money in a good clarifying shampoo can bring big difference in getting rid of oily hair. Reason is clarifying shampoo will absorb any unwanted excessive oils. If follow these simple things will help you find a good shampoo that will give you confidence about getting rid of oily hair. Normal liquid shampoo with 100% natural oils or dry shampoo with a magical blend of several essential nutrients – you can choose from a variety of shampoo for your oily hair. These are the best shampoo for oily hair available out there that will not only help you combat oily hair but also provide proper conditioning so that you can enjoy voluminous hair!